Someday Sewing – Page 2 – Welcome to the adventures of a mostly self-taught sewist and her 2 cats. I have been a Seamwork subscriber for quite a while. I like a great deal of their patterns, articles, tutorials, and their inclusivity in their sizing and models. Although, I would love to see a little more consistency in their sizing. The Nantucket shorts are actually the very first pattern that drew me to Seamwork in a Google search for plus size shorts patterns. What’s funny is that I never made them. I made half a dozen other Seamwork patterns, but never seemed to get around to the Nantucket shorts! Well, I have finally gone and made them! I had this nice light-weight blue chambray in my stash and thought they would make some nice summer shorts. You guys, I have a problem. I keep my underwear until it basically falls apart and cannot be mended any more. They are threadbare, holey, and the elastic is not attached around most of the waist any longer. It’s a little embarrassing. Why? Well, for one I am super thrifty. I hate to buy anything new if what I have is still usable. For instance, my husband bought me a new ebook reader for my birthday, because he hated that I was reading around a crack in my old ebook screen for years. It still worked and I couldn’t bear to get rid of something that was still 90% functional! I’m getting back into the swing of sewing. Finally! I wanted to have this dress done for a work event, but they instructions really threw me so it took me quite a while to complete. If you like origami, you will like the Style Arc Autumn, because it requires some folding skills! I bought this purple woven fabric ages ago, but I couldn’t tell you what it is anymore. It is sort of fuzzy like a faux suede on the outside with a sort of a shiny, smooth inside. When Erica asked me to be a tester for the My Body Model app, it felt serendipitous! She didn’t know this, but about 6 months earlier I had taped a picture of myself to a window and traced around my outline to decide on wedding dress silhouettes. It worked in a pinch, but it was nowhere near as good as the My Body Model croquis. You put in your measurements and you get this nice croquis that you can customize with your hair, and face, if you want, and outfits. The light gray lines are nice because they disappear under the clothes once you put in some color or heavy lines. 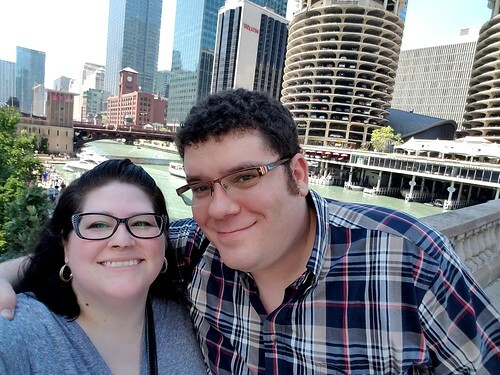 We recently took a little mini-vacation in Chicago. Normally on a trip we pack in the things to do from sun up to sun down, but this time we really just needed a relaxing weekend. Instead of hitting all of the sites we booked a boat tour of the river and lake, had some cocktails, took naps, and visited some of our favorite shops. I did add one shop to our trip that I had heard of, but never visited. It’s called Textile Discount Outlet. It had really great reviews online and it was on our way out of town so I convinced my kind, patient, loving husband that 13 rooms of floor to ceiling fabrics and notions, really wouldn’t take that long to go through!